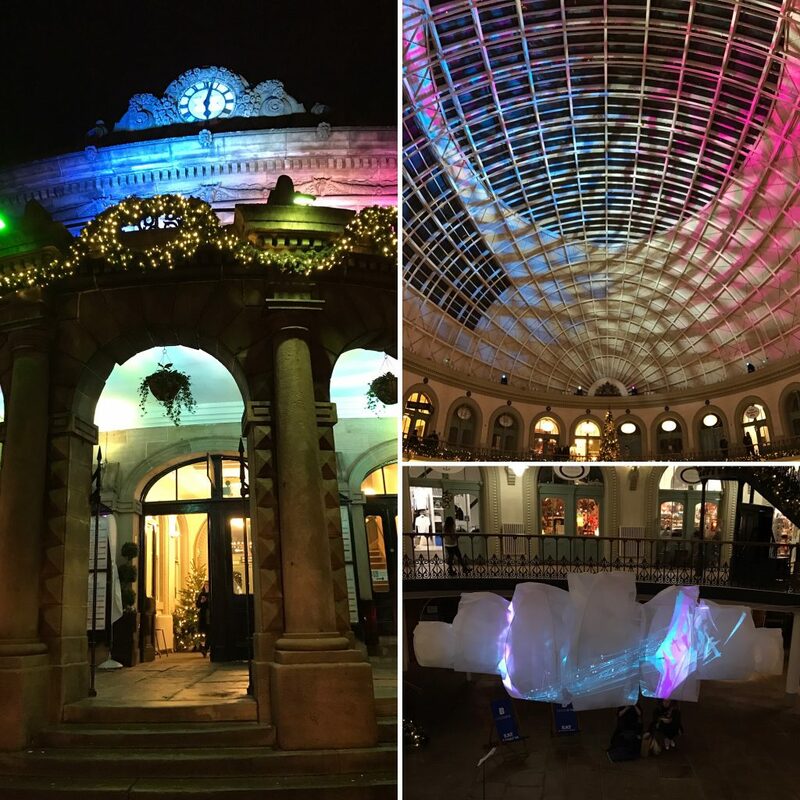 Throughout December, there have been a number of installations across Leeds as part of Leeds Bid‘s “Christmas in Leeds” project. 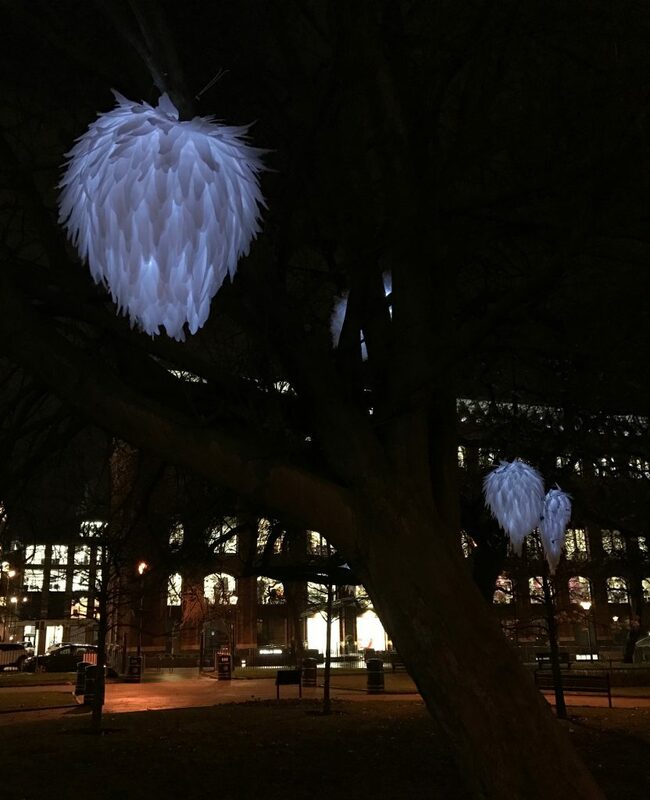 The trail is made up of 15 different art and light installations, created by various artists and organisations. My intention was to visit all the points on the trail, but due to being ill for what’s felt like most of the month, I haven’t got around them all. I did manage 10 of the 15 however. Some are perhaps not worth a special visit on their own, but are pretty enough in passing, whereas others look rather impressive and are worth going out of your way to see. The easiest ones for me to visit (as I get the train to work every day) were in the train station. 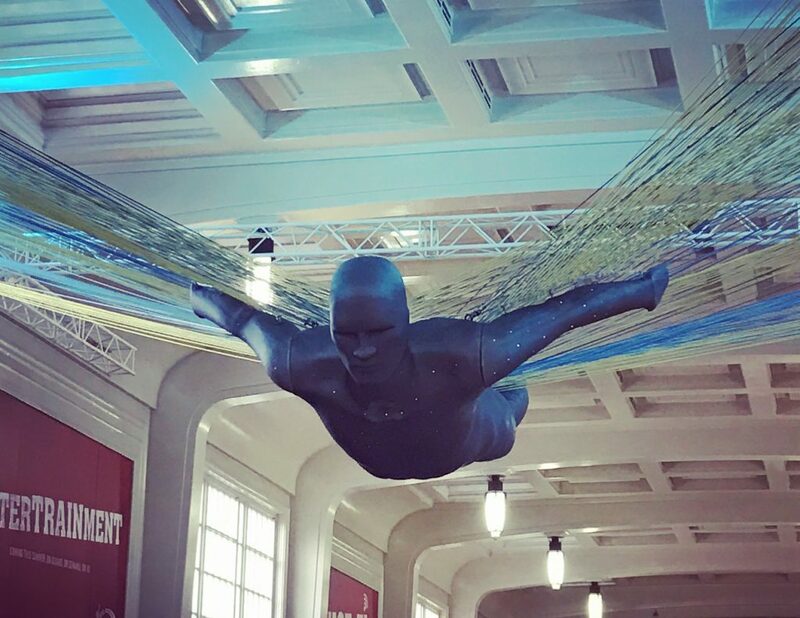 Number 7 on the map is “Spirit” – an “ethereal figure” hung high in the railway station, created by Newsubstance. This was put in place a few days before the start of the project, and it did make me curious as to what it would be. I saw it wrapped up in tape and it looked liked a crash test dummy! The finished result is a lot more majestic. Also in the train station (no. 13 on the map) is the Northern Ballet Christmas tree (which I must admit looks more like an advertisement than a magical installation, but it’s still nice and festive). Heading out of the station in to City Square is no. 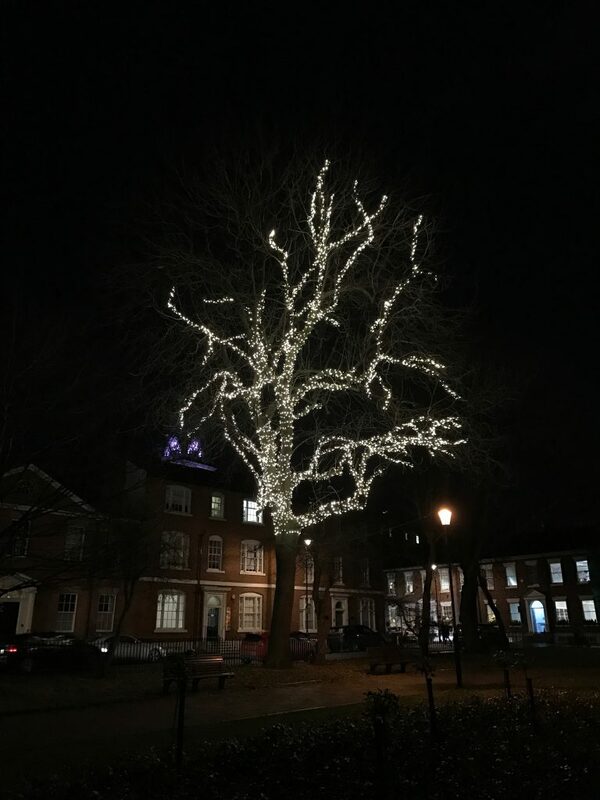 15 – the Christmas tree. I always love it when the tree’s put up here. This year it has a box around the base of the tree highlighting some of the great places Leeds has to offer. To the left of the station, I didn’t get a chance to see numbers 4 (“Christmas with us”) and 5 (“waggon lifting hoist projections”) but did manage to get to Park Square. I was glad they had something on here as it looked so impressive during Light Night just a few months ago. As part of this project, they have 20,000 LEDs on the trees in the park (no. 1 on the map), and an installation entitled “textures of winter” (no. 2) – recycled plastics made to look like ice formations melting and re-forming. 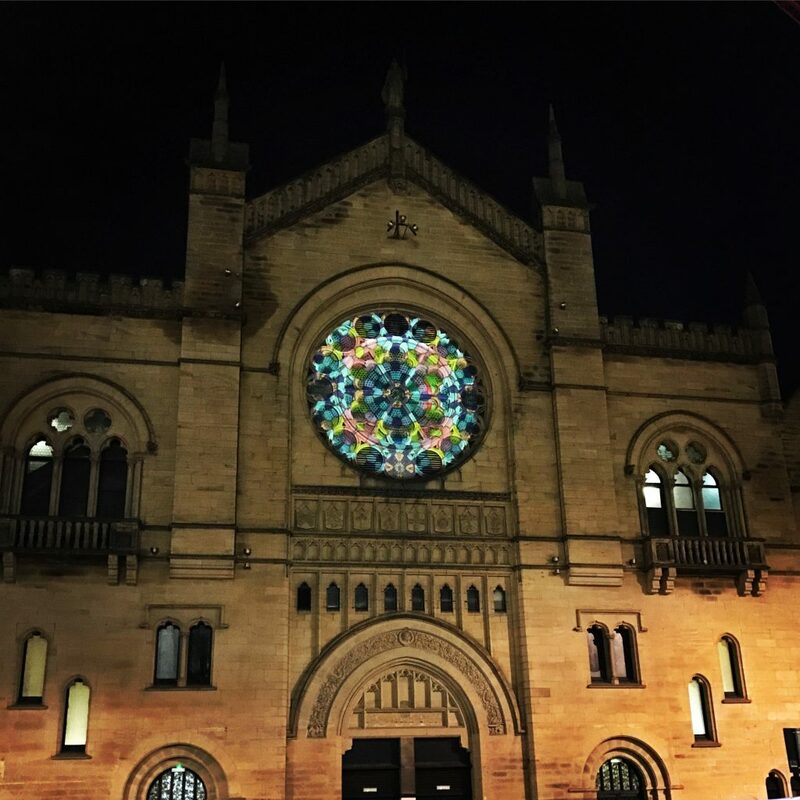 I made a small detour one evening to look at “radial” – a light projection created by Lumen onto the O2 Academy. This was probably my favourite item on the trail. It made me realise that I’d never properly looked at the building before, which is a shame as it’s rather beautiful and gothic. Unfortunately I didn’t get a chance to see a few things on one section of the map – numbers 14, 8 and 11 – Santa’s Christmas Post Office in the Merrion Centre, The Wishing Tree in St John’s Centre and the Harvey Nichols’ window display on Briggate. I did however see no. 10 – the “waterfall” lights on Holy Trinity Church and no. 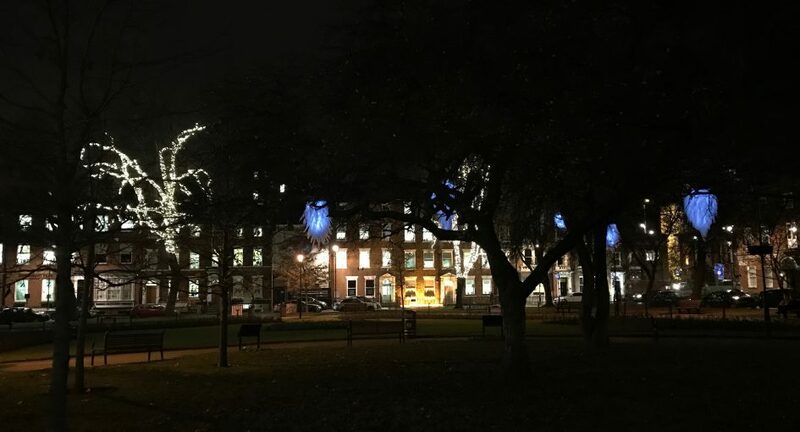 12 – the “kissmass” tree in Trinity. There’s a counter at the base of the tree, noting the number of kisses that have taken place underneath the tree. And to finish it off, I went to visit the Corn Exchange to see no. 3 – “The Northern Lights” – an exploration of the Aurora Borealis – and no. 9 – “The Murmuration Cloud” – light projections that respond to volume and pitch. 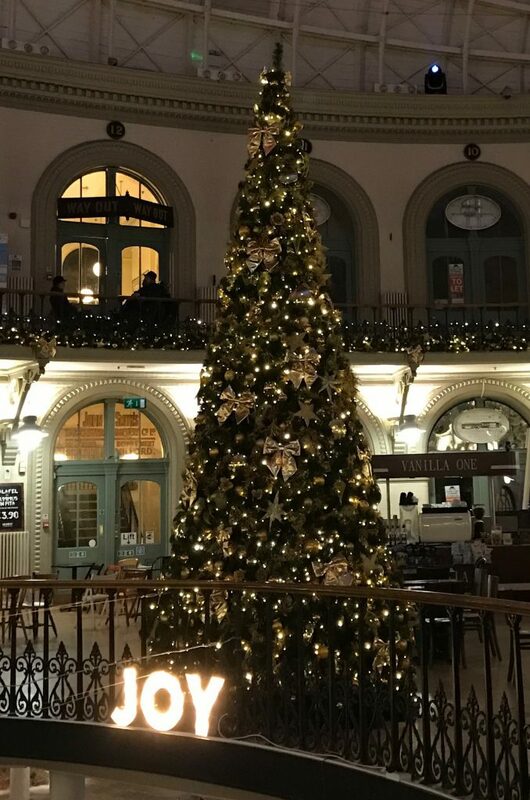 I was glad for an excuse to visit the Corn Exchange as it has a spectacular Christmas tree in and the whole building (which I always think is impressive) is decorated beautifully. 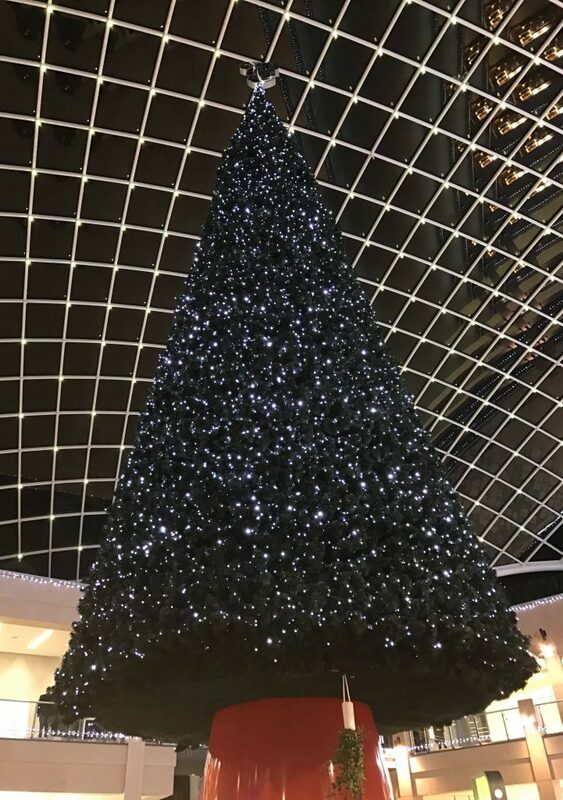 Although not on the Christmas in Leeds trail, it was well worth popping in to admire the tree. 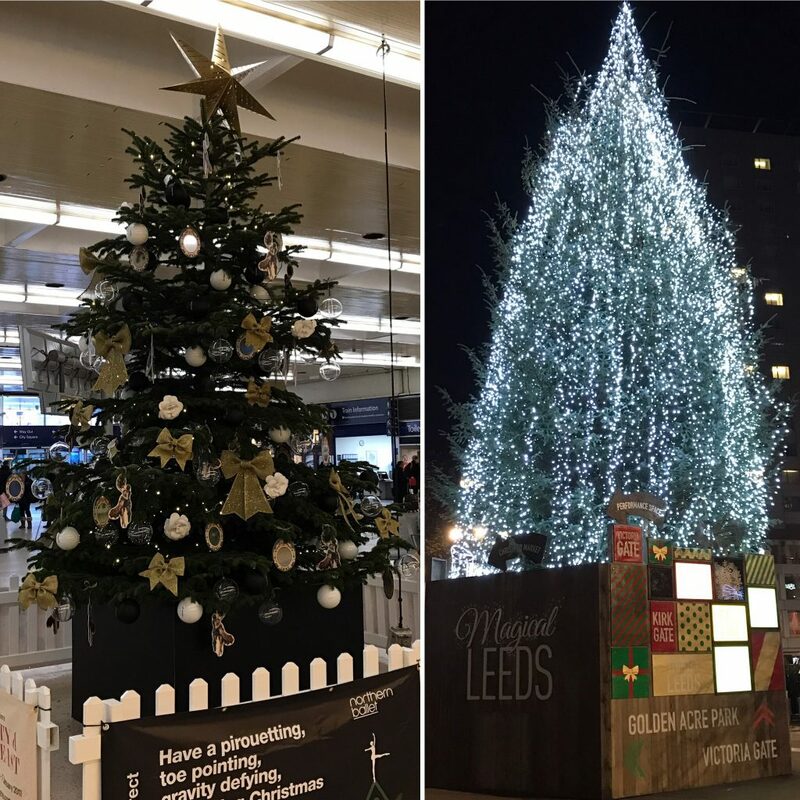 The #ChristmasinLeeds trail is on until 3 January, so if you’re out and about in Leeds within the next couple of days, do go have a look!